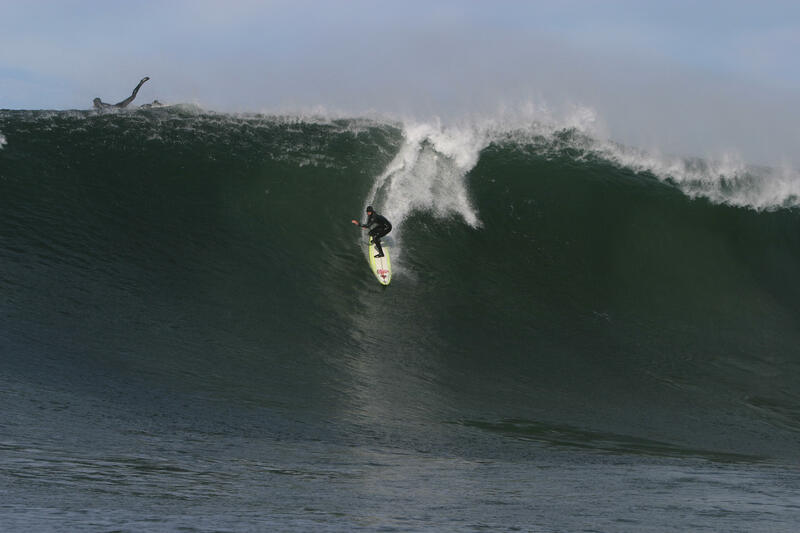 It wasn’t the first time Sarah Gerhardt paddled out at Mavericks, or even the second, when she rode her first cold mountain. But on her third trip into those frigid, sharky waters where booties and a hood are required apparel, she became the first woman to surf the infamous Northern California spot. The tale of what shaped Gerhardt into an athlete brave, confident and skilled enough to take on the so-called Everest of surf breaks is told in Elizabeth Pepin Silva’s One Winter Story. Completing the double bill is Silva’s most recent project, Introducing the Super Stoked Surf Mamas of Pleasure Point. While One Winter Story is a portrait as deep as the waves Gerhardt rides are steep, Surf Mamas delves into the burgeoning connection among five Santa Cruz women who surf, love the ocean and get pregnant about the same time. Their wetsuits display their growing bellies as they share waves with babies onboard. Once the kids are born, the friends’ lively and supportive community evolves far beyond mutual child care so they can get back into the salty waves. “What hooked me on surfing was feeling utter freedom,” says Gerhardt, now a chemistry professor and mother of two who continues to surf Mavericks. Silva and collaborator Sally Lundburg capture that exultation in what appears to be miles of archival footage of Hawaii’s North Shore and Mavericks, mostly black-and-white or low saturations of color. But there’s not an archival frame in One Winter Story; the two filmmakers shot everything. 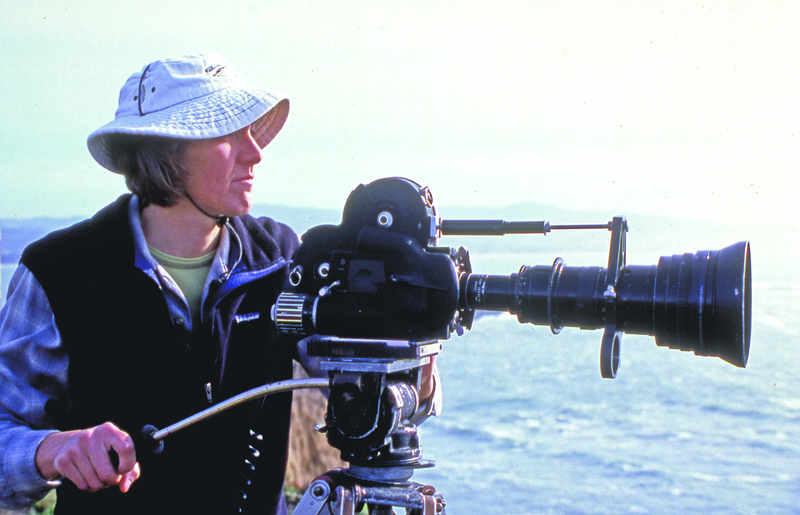 A student at the San Francisco Art Institute at the time, it was Lundburg’s idea to shoot in 16 mm. Silva had been working as an associate producer at a public-television station in the Bay Area and had solid PBS-style documentary chops. “By 2001, when Sally asked me to make [One Winter Story], I was eager to start making my own films and being freer in deciding how my films would look and feel,” Silva says. With no funding, they used whatever stock they could get, much of it donated. “The choice to mix black-and-white and color film was both random and thought-out,” says Silva. The experimental approach is as appealing as the story, and it’s edited in a cohesive way to evoke archival footage, the warmth of Hawaii and winter in NorCal. One Winter Story is a portrait of Sarah Gerhardt, the first woman to surf Mavericks. Photo courtesy otwfront.net. There was another obstacle in making the surf doc. “We wanted to tell Sarah’s life story, but how do you do that when your subject was poor and often homeless and had only 10 photographs of herself from ages 0 to 18?” asks Silva. The nearly abstract sequences serve to turn down the volume on what we see in order to take in Gerhardt’s charged recollections. As a child, she was sole caregiver for her wheelchair-bound mother, whose MS didn’t prevent her from earning a master’s degree. Though her mother lived with limitations, “she lived as if she didn’t have any,” Gerhardt says in the film. And neither did she. 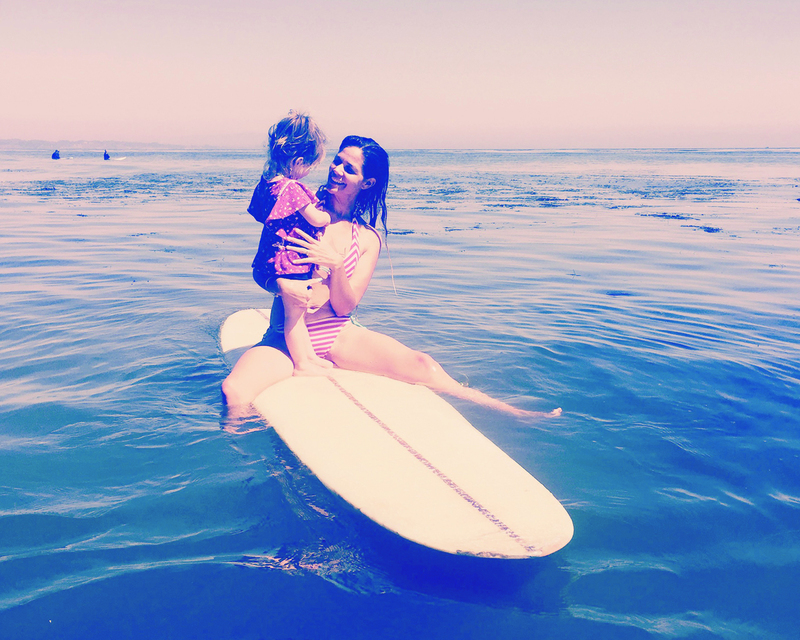 Freedom, no limits and a pioneering spirit also infuse Surf Mamas, which, at 20 minutes, ends too soon. That first exquisite re-immersion in salt after a hiatus on land stands out in each doc. 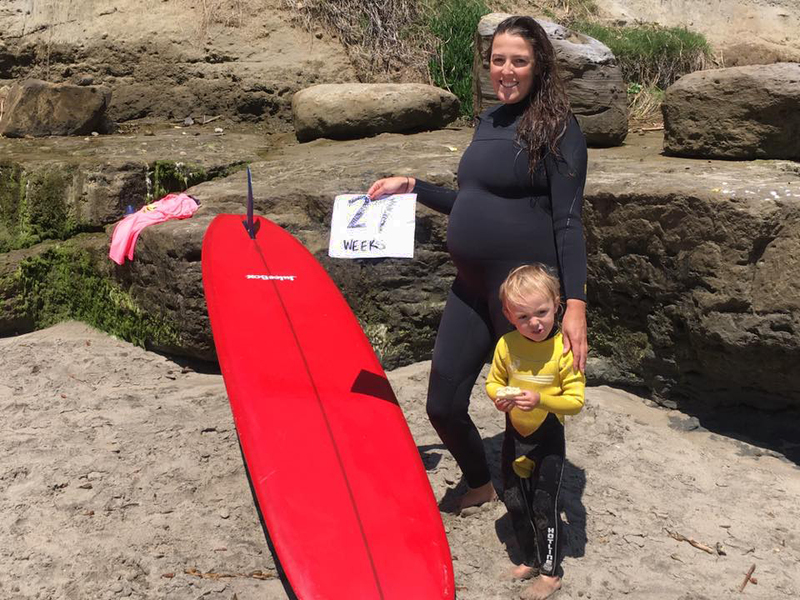 The flack the women receive for surfing pregnant or just while female on the big waves at Mavericks acknowledges the misogyny, but it doesn’t dwell there. And a carefree intimacy is mirrored in both films: In One Winter Story, we see Gerhardt and her husband, Mike—an expert big-wave rider who is gracious when referred to as “the husband of the woman who rides mountains”—slowly pedal bikes in their wetsuits with their boards under their arms; and in the other, three Surf Mamas walk barefoot in wetsuits, also with boards under their arms, happily anticipating getting into the water together. As in all surf films by the Emmy-winning Silva, the water footage is a thrill, especially for nonsurfers seeking wave joy. Collaborator Paul Ferraris shot much of Surf Mamas and also worked on Silva’s previous film, La Maestra, the fly-on-the-wall portrait of schoolteacher Mayra Aguilar, the first woman to surf the local Baja Sur break near her village. When I learned Aguilar was one of the Surf Mamas, I expected she had been the seed of the project. Loggins and her daughter, who appears as a baby bump in Surf Mamas, will attend the screenings along with Silva. The event benefits Sandy Feet’s upcoming summer programs and Silva’s next film, about local surf legends Linda Hanson and Joyce Hoffman. Women’s Surf Film Fest at Ole Hanson Fireside Room, San Clemente Community Center, 100 N. Calle Seville, San Clemente, (714) 206-3810; www.sandyfeetoc.org. Sat., 4 p.m. $20. So excited to read your article. Love hearing and seeing the women!!! Lotta women grew up in the waves of the beaches of OC- myself included. Mom was a music teacher, and in her 6 weeks off school in the summer, she took us down every single day.